LS series precision balance is an exceptional instrument. Highly accurate precision balance is available at the moderate price and can be used for different purposes. The cast aluminum housing of this precision balance protects it and ensures longer service life. The graphic display with power indicator makes reading of the data easier. With the optional software package of the precision balance you can transmit data to a PC or laptop. If your computer has only USB interface, you can request RS-232 adapter for USB. In addition to the automatic internal calibration system, you can perform an optional external calibration with test weights (only if the balance is not checked). You can also calibrate the precision balance in a control laboratory accredited for it (e.g. for compliance with ISO) or check it in the responsible agency in your community. Other advantage of the precision balance is the possibility to determine density (overall index of all precision balances). Here we list the features and technical specifications of this precision balance. If you have any questions about the precision balance (with 3 year guarantee) or other similar models, please call or email us: +44 ( 0 ) 2380 98703 0. Our technicians and engineers will be happy to help you with this precision balance and of course, with the other products in the field of regulation and control systems, measuring instruments or the balances. In the upper image, you can see PCE-LS 500 series precision balance with a round weighing pan of 120 mm diameter. 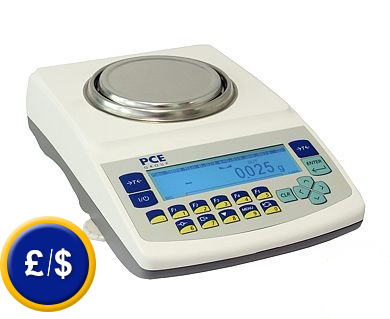 The lower image shows PCE-LS 3000 series precision balance with a square weighing pan (165 x 165 mm). Both weighing pans are made of stainless steel and can be used for all kinds of laboratory tasks, production and research. change of the piece indicator to weight. ± 1 ° C variation or after an interval with a fixed time, the balance carries out an automatic adjustment (internal weighing). indicates the weight range availability. guarantees high robustness and long service life. - Measurement of density by an optional density determination equipment. example to comply with DIN ISO 9000). - Precision balance for professional use. 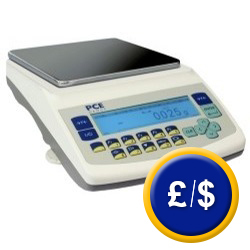 Apart from the digital reading of the weighing data and the large graphic LCD display, this precision balance comes with a range (0 ...100 %) to check the used range directly. Besides, you will be able to adjust both the intensity and the back light via the keypad. The upper image shows the display of the precision balance with the backlight off. A verified precision balance is recommended to be used for making medicines in pharmacies as well as for the analysis in medical and pharmaceutical laboratories. Upon your request we can carry out a calibration for you. a) Trade relations when the price of the product is determined by its weight. b) Making medicines in pharmacies as well as for the analysis in medical and pharmaceutical laboratories. c) Determination of rates, tariffs and official fines as well as for official and objective surveys in judgements. Each precision balance is checked by the official authorized centre to provide it with a verification certificate. EU Verification is valid in all the countries of the EU (European Union). c) Determination of rates, tariffs and official fines as well as for official and objective surveys in judgments. Calibration certificate for the balances can be done by the official authorized centre. EU calibration is valid for all the countries of the EU (European Union). Balance calibration with CAL adjusting program: The adjusting program is marked with an official mark once calibration has been carried out. Calibration will be valid for the given location. So, it is necessary to provide your postal code for the calibration. Calibration can be performed in the company or in the location of the balance depending on the balance. Calibration of a balance with adjustment of automatic change: There are not any limitations depending on the location of the balance due to the fact that the automatic adjustment can be used after a calibration has been done, i.e. it is not sealed. In this case, calibration will not depend on location. Calibration value: measurement of calibration tolerance which is always between 1 and 10 d.
The kit includes a software to transfer data to a PC or laptop and RS-232-cable. The transferred data can also be sent to other software such as Excel. If your computer has only USB, you will need the USB adapter. Balance software comes with data cable RS-232. If you want to submit data to a laptop or computer or any other system with memory, you must use this USB adapter (which includes the start-up software). To print the results of the precision balance directly (e.g. to document weight data in the laboratory), it comes with a RS-232 printer cable and a 240 V adapter The paper width is 112 mm. The verification of this precision balance can only be made by the official agency in your community. Once the official verification is done, it is not necessary to calibrate the balance with external calibration weight. First verification is valid for two years, then you will need to verify the balance annually. For companies wishing to incorporate the precision balance in their internal control group of tools or for annual recalibration. The ISO has a laboratory calibration with document that includes the measured values. You can also include the name of your company or customer's information. (EII class, 100 or 200 g according to OIML). This control weight can only be used to recalibrate the analytical scale in situ and to control the accuracy of the balance quickly. The equipment is used to determine the density of solids (solid bodies). It uses the hydrostatic principle. Density is the ratio of the weight [g] and the volume [cm ³]. The weight is obtained by weighing the test material in the air. The amount is determined by the impulse [g] of a proof of material submerged in liquid.